Philadelphia Innovation Cluster Seen as "Key to Future"
"I'm a bit like Ryan Howard," Philadelphia Mayor Michael Nutter told the crowd at the Navy Yard. "I get to bat clean-up and take us on to the championship." The Mayor's reference to the city's major league baseball team seemed a good analogy for a championship he has long wanted, the title of "Greenest City in America." The sentiments weren't lost on the other dignitaries, academics, industry leaders, and cleantechies gathered in a tented area on the pier of the Navy Yard's Cruise Ship Terminal to celebrate the launch of the Greater Philadelphia Innovation Cluster for Energy Efficient Buildings (GPIC). The Mayor opened and closed the ceremonies, which also featured speeches by Pennsylvania Governor Ed Rendell, US Secretary of Energy Steven Chu, Assistant Secretary of Commerce John Fernandez, and Vice President Henry Foley of Penn State. Penn State led the application for the energy efficiency hub, marshaling a consortium that featured other universities, major corporations such as United Technologies and Turner Construction, as well as a panoply of associations and other businesses. The result was a successful bid for the nation's only energy efficiency cluster, and $129 million in funding from the Department of Energy (DOE) and other agencies. The Navy Yard has plenty of old buildings on its 1200 acres and its own micro electricity grid to test new technologies. And the list of players and supporters of the proposal were just too hard to ignore, remarked Secretary Chu, who said that it was "a dream in my eye long before I was at DOE for such a center." The Secretary confessed that he would have liked the Lawrence Berkeley National Laboratory win the bid, where he worked prior to becoming the 12th US Secretary of Energy. "But the fact that two of my former grad students are at Penn State makes up for the fact that they didn't get it," Chu quipped. 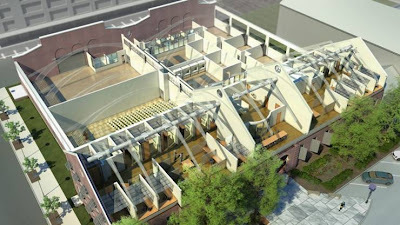 The GPIC is expected to develop and test new technologies for energy efficiency in buildings, first by renovating an existing structure on the campus. Poor cooling and ventilation in the facility where the announcement was held provided a good example of the issues that will be addressed by technologies developed at the new innovation cluster. The GPIC will be led by Penn State in partnership with the City of Philadelphia through its Philadelphia Industrial Development Corporation, along with Ben Franklin Technology Partners of Southeastern Pennsylvania, the Delaware Valley Industrial Resource Center, the Wharton Small Business Development Center, and numerous other public, private, and academic partners. "This is the type of research and technologies that will propel the US going forward," Secretary Chu said. "And this type of broad cooperation exemplified here in Philadelphia will make it work." I think it's Friday...been a crazy week: one day I'm at the Clinton Global Initiative and the next I'm sitting in a 2nd Grader's chair hearing about how they roll in elementary school these days. Whew! A new study says the rate of groundwater depletion has doubled since 1960, a rate that researchers from Utrecht University said is clearly unsustainable. You want to talk about a real crisis, we need to figure out how we're going to survive with less fresh water in our world: H2(n)O! Actually, that's probably a good movie-tonic for our current recession! I'm not going to be in Tianjin next week for the Eco-City Forum (bummed), Tom Friedman was there last week for the World Economic Forum. He is still stunned by China's progress as he notes in to reports from the front: "How can you compete with a country that is run like a company?" and "Aren't We Clever?" Meanwhile, back home, there was some good news in cleantech investment this week as Greentech Media reported on Real Greentech IPOs, M&A and More than $100M in VC. The Clinton Global Initiative sessions archive is up. You can catch much of the dialogue here: CGI Archive. And finally, for those who missed it, here is the video of my spot on FOX Business with Stuart Varney and Governor Christine Todd Whitman: The Governor and The Green Skeptic. I was on FOX Business this morning with Stuart Varney and Governor Christine Todd Whitman talking about why environmentalists are disappointed by the Democrats. Along with a plea for a moderate, practical approach to the environment and reclaim it as an issue from the extreme. If you've never traveled in villages and rural areas of the developing world, it is difficult to imagine that nearly 3 billion people still cook with primitive technologies from earlier centuries. The World Health Organization (WHO) estimates that almost 2 million people die from being exposed to toxic smoke from cooking with wood and other unclean fuels. The majority of those deaths are women and children. Smoke from cookstoves contributes to a host of chronic illnesses and acute health impacts, including early childhood pneumonia, emphysema, cataracts, lung cancer, bronchitis, cardiovascular disease, and low birth weight. Not to mention the devastation to the environment from deforestation, which can lead to flooding and other disasters. In addition, women who cook with wood spend hours gathering fuel for cooking, taking them away from educational or business opportunities, and putting them at a safety risk as they often travel miles away from home. Now a new initiative developed by the UN Foundation, in cooperation with a host of public, private, and non-profit partners, is planning to do something about it. The Global Alliance for Clean Cookstoves was announced today by US Secretary of State Hillary Clinton at the Clinton Global Initiative annual meeting in New York. Their goal: 100 million homes adopting new, clean stoves and fuels by 2020 ("100X20"). "Today we can finally envision a future in which open fires and dirty stoves are replaced by clean, efficient and affordable stoves and fuels all over the world -- stoves that still cost as little as $25," said Secretary Clinton. 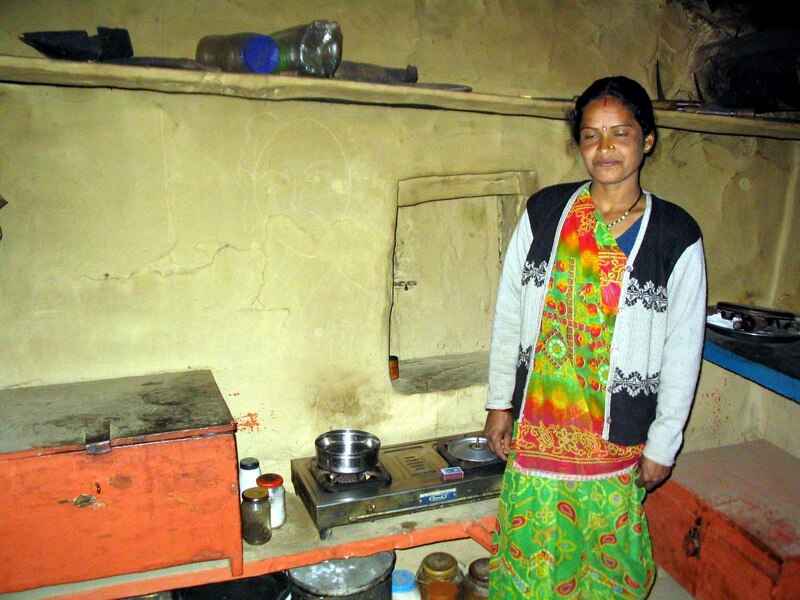 "By upgrading these dirty stoves, millions of lives could be saved and improved." Secretary Clinton suggested that "Clean cookstoves can be as transformational as bed nets or vaccines." The Secretary also announced an initial US financial commitment to the Alliance of $50 million over the next 5 years. An additional $10 million was pledged from partners. The total goal is $250 million over the next 10 years. At $25 per stove, that buys a lot of stoves. Adoption of new stoves can be difficult, Secretary Clinton acknowledged, which is why the Alliance will make every effort to incorporate local tastes and preferences rather than investing in one type of stove. Hospitals are in the business of healing. So it should be no surprise that one leading medical institution has been leading the way on healing the planet. Christiana Care Health Systems serves all of Delaware and seven counties bordering the state in Pennsylvania, New Jersey, and Maryland. 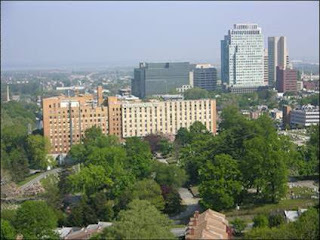 Christiana has more than 1,100 licensed hospital beds in two hospitals and over 10,000 employees. As one of the region's largest employers, they are committed to making their facilities clean and safe for staff and patients. A few years ago, a small group of staff formed a team to help green their operations. Most probably thought of it as the right thing to do, but they soon realized it was not just about going green. There was green to be made through savings. The team started with small goals: reduce waste and organize what they were already doing that was sustainable. They hired an industry savvy consultant who helped them target various waste streams and look for cost savings throughout their operations. Hospitals throw out a lot of stuff. From bed pans to Styrofoam cups; from paper and cans to xylene and alcohol. There is also an enormous amount of "regulated medical waste," most of which must be disposed of in special red "Biohazard" bags. The team conducted an audit of the waste stream, even tracking it from the facilities to the dump. They found savings and waste reduction opportunities at every turn. Reductions in "red bag" waste were cut by 50 percent at a savings of over $210,000 a year; implementing an extensive recycling program -- even for chemicals -- led to additional savings after a modest one-time cost. Next the facilities entered into power purchase agreements for 15 percent of the total output of the Locust Ridge II wind power facility in central Pennsylvania. They even hosted two "medicine cabinet clean-out" events for the community in cooperation with the Delaware Nurses Association. This last effort safely retrieved old and expired medications that otherwise may have entered the groundwater system if disposed of improperly. "Commitment," said Robert Mulrooney, Christiana Care's Vice President of Facilities and Services, speaking at the Academy of Natural Sciences last week as part of its Profitable Pathways to Sustainability Program. "Commitment of time and people. We don't yet have one person solely devoted to this 100 percent. That would really drive it." Rather, Christiana's effort relies on 50 environmental champions from throughout the staff. They must be doing something right. Last year, Christiana Care received the EPA's Trailblazer Award for its environmental leadership. Christiana's green team is not resting on its laurels. They have come up with even more ambitious goals moving forward, such as achieving a recycling rate greater than 25 percent, purchasing safer and more sustainable products, reducing water use by more than 20 million gallons per year. "It is part of Christiana Care's mission to care for our planet as we do for our community," President and CEO Dr. Bob Laskowski has said. Perhaps it is time to recognize that a healthier planet can lead to healthier patients. 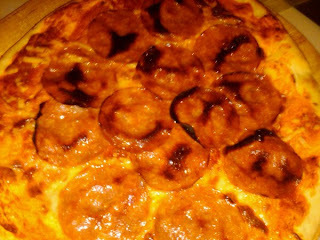 Pizza of the week: Kosher salami w/2 cheeses. GreenTech Media talks with Guido Bartels about the smart grid industry ahead of next week’s inaugural GridWise Global Forum: The GridWise Alliance. My pal Gregor Macdonald pointed to this disturbing insight that basically throws US climate change politics under the bus: World Bank invests record sums in coal. The DOE opened their shelves for perusing by entrepreneurs and investors looking for leading-edge technologies available for licensing: Technology Commercialization Portal. Thomas Friedman's sobering observation that we basically traded silicon chips for poker chips, and how we're stuck being second best. We're No. 1(1)! Speaking of poker, Mark Suster of GRP Partners has a great series of posts on Angel Investing up on his Both Sides of the Table blog. Here is the first, on Dealflow – Are You Sitting at The Right Poker Table? I encourage you to read them all. And finally, Fred Wilson of Union Square Ventures starts a conversation (as only he can!) on the two worlds of Venture Capital: Two VCs. This morning I got a note from one of my heroes, Jacqueline Novogratz, founder of the Acumen Fund and author of The Blue Sweater. She's been traveling in Pakistan with her husband Chris Anderson (no relation) and witnessing first hand the devastation there caused by massive flooding. The floods have displaces 20 million people and destroyed 1.2 million homes, damaging 4-5 million more. Those are big numbers and hard to conceptualize, so she also sent this video to help put faces to the numbers. Please share this video with your networks and let's do something about this -- every little bit helps. Go to www.ontheground.pk to find out how you can get involved. How many of you caught this Nissan LEAF polar bear commercial during last night's Saints-Vikings game? I know some environmentalists will hate this, but I think it's very clever. Don't mess with the bear. A short week and a short list for today's Green Skeptic LinkFest. Fisrt up, Alex Taussig of Highland Capital Partners had an excellent post on his Infinite to Venture blog, which was picked up by GigaOm's Earth2Tech. A must read: "Dear Pundits: Energy Policy Needs an ROI." Chris Dixon of hunch took some shots at VCs with his excellent post "Things I'd do if I ran a big VC firm." 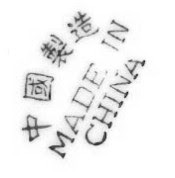 It was China week here at The Green Skeptic, and first and foremost is David Sandalow of the Department of Energy blogging on Whitehouse.gov on U.S./ China cooperation energy research. And I weighed in on the Cleantech Group's new report on "Cleantech Innovation in China." Finally, if you missed Howard Lindzon's fun and informative series of interviews on "The Web is Dead" on StockTwits.tv, you need to go watch them NOW: The Web is Dead. The Times also had a special report on energy efficiency "Doing More While Using Less Energy"
Philadelphia was in the news again with this piece on efforts to make Philadelphia's Navy Yard a mini-city of energy innovation: Grid Wit? The Brookings Institution also weighed in with "Energy (and Economic) Transformation Come to the Philadelphia Navy Yard"
And Lux Research assesses the likely winners and losers in the next round of solar meltdowns: Who Will Thrive, Survive, or Dive? What do you get when you pair the latest 21st century energy technologies with with one of the country’s oldest transportation systems? Viridity Energy, a Philadelphia-area smart grid company, and the Southeastern Pennsylvania Transportation Authority (SEPTA), which has its origins in the early 1900s, when electrified trolleys were the transportation du jour, have teamed up to find out. Their pilot project will use Viridity Energy's software optimization system to help SEPTA capture and recycle energy generated by trains, trolleys and even electrified buses using the existing regenerative braking capabilities of those transportation systems. Regenerative braking isn't new. The energy generated by SEPTA's trains is currently captured and fed to the system's third-rail to power other trains. The innovation here is to store and use the energy through a one megawatt battery array, which should reduce electrical power purchases by 10-20 percent at each location where the batteries are deployed, according to Viridity Energy. Viridity estimates that one battery will generate $500,000 per year in value. SEPTA hopes to install the technology at all of its electric substations serving trolleys and trains. It may also allow SEPTA to purchase power at night, when rates are low, and potentially provide power to the grid to stabilize regional demand during peak usage events. The partnership with SEPTA is "a perfect example of how smart grid innovations and advances in technology can effectively be paired with revenue opportunities from competitive energy markets to yield substantial economic, operational and environmental benefits," said Audrey Zibelman, President and CEO of Conshohocken-based Viridity Energy. For SEPTA, the project is "a foundation for measurable gains in both energy efficiency and voltage stability" in what is one of its busiest corridors, and "a replicable and scalable model for broader system-wide implementation," according to a spokesman. The partnership received $900,000 in funding from the Commonwealth of Pennsylvania through its 2010 Pennsylvania Energy Development Authority (PEDA) grant program.